Black Ice Software - Tiff Viewer version 11.55 is released! Black Ice Software has released version 11.55 of the Tiff Viewer. This version includes newly improved Optical Character Recognition (OCR), providing more accurate conversion of typewritten text into editable text files when using the "OCR all pages" and "OCR selected area" features. 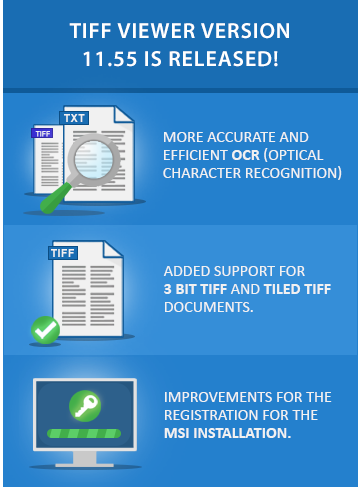 The latest TIFF Viewer version 11.55 includes new support for 3 bit TIFF documents and Tiled TIFF documents, greatly expanding the number of supported TIFF documents. The latest Tiff Viewer includes stability improvements for the TIFF Viewer MSI installation for the registration when using the CUSTOMINI parameter. The TIFF Viewer MSI installers are designed for large scale deployment in Active Directory environments.